Xiaomi has been disrupting the various industries since it first came into existence in 2010 as an internet startup, which use to offer only MIUI firmware based on the Android operating system. But now company has already expanded into the electronics markets for smartphones, Tablets, TVs, and now the wearables technology with their ultra affordable Mi band. Allow us to introduce this device, which is not only the most affordable piece of fitness device. But has a companion app that can show your steps in real-time, as the synchronization is too fast in the Mi Band app. When compared to the companion apps of the other fitness bands like Fitbit, NikeFuel Band, Jawbone Up24, etc. We have been testing the fitness tracker for quite a time now, after giving you a peek into what Xiaomi Mi Band can do in the initial hands and first impression. Now we talk about the abilities of this device, as well as whether or not if it is worth the price. While it might not be designed keeping in mind the style of Jawbone Up24 and sturdiness of GOQii fitness band, as you may not get hooked to it at first glance. But it sure does have a simple charm and comfortable design aesthetics to follow, as wearing it all the time (sleeping and showering) won’t make your hand feel uneasy. Its rubber strap allows you to adjust the band according to the size of your hand. During testing, sometimes it was barely noticeable that the band was on the wrist as it felt very lighter than most of its competitors. Note that, it is a water resistant, but not a waterproof device, which means you can take it under the shower, but it is not made to withstand the pressure while swimming. The stock black rubber band looks simple and minimal and goes well with pretty much any outfit you wear. While the silver front of the tracker gives a stylish and shining look with Mi logo printed on the back part of the tracker. For those who want variety, they can easily take out the actual tracker and swap it with different color bands, matching their outfits. It is almost exactly the same size as the Fitbit, though much softer, and round shape compared to Fitbit’s sharp, square features. 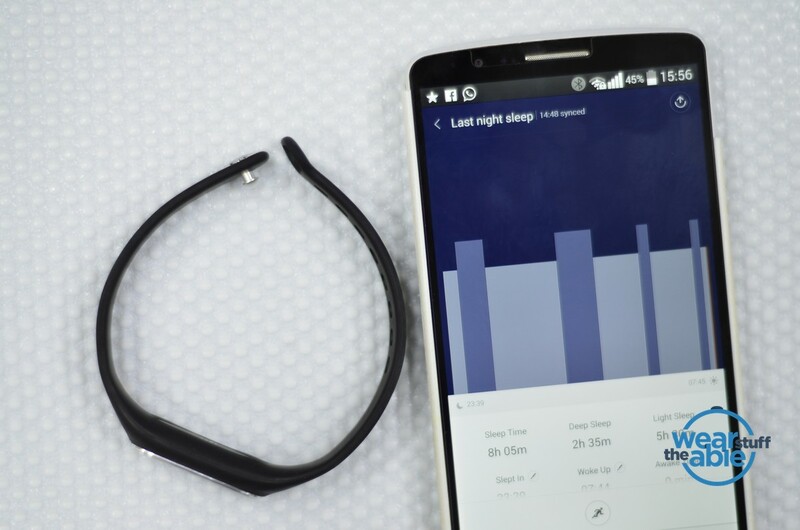 As the Mi Band hardware looks to be in par with the other popular fitness bands, the app is less feature-rich. Instead, it opts to show straight forward data metrics rather than giving you suggestions in improvements. Once you have downloaded and installed the Mi Band app, which is quite an extensive task as the official version of the Mi Band app is not available in English. And if you are experiencing the same, then let me redirect you on how you can get started on the setup. To note that, currently, the app is only compatible with Android 4.4 Kitkat devices, and some features are only present of the Mi devices running Android 4.4 based firmware. Xiaomi smartphone owners get a perk to unlock their device with a password, when the band is close to the smartphone, recognizing wearer as the user. Pairing the Mi band to your phone via Bluetooth is quite painless, as it requires only few quick taps and device is ready to track your health data. You need to enter few personal stats like age, height and weight. And you also don’t need to take your smartphone with you all the time, the data syncs up as soon as you are back in the Bluetooth range. It allows you to set daily goal for how many steps you pledge to take, which by default is set to 8000 steps a day. It has a tricky way to show you how far you are from your day’s goal. Making a gesture as if you are looking at a wristwatch will trigger the reaction of Mi Band to light up with color. Where one light is for one-third, two lights for two-third, three lights for when the goal was completed. Note that it’s difficult to see the lights in direct sunlight. The Mi Band can also be set to vibrate after a missed call, but, unfortunately, no other notifications from apps or SMS are available. It was quite a disappointment, as it seems like an obvious use case that should have been included as one of the functionalities on this fitness band. Nonetheless, this stingy use of vibration and lights was designed to preserve battery, and it apparently gives more than the rated 30-day battery life. That far cry on the other fitness bands likes four-day for FitBit and approximately ten days on the Jawbone tracker. As well as Mi Band only needs few minutes on the charger to get all juiced up for several days of power. It means less stress about whether or not that your fitness band is about to die, and more time spent actually wearing the device and gathering the health data. 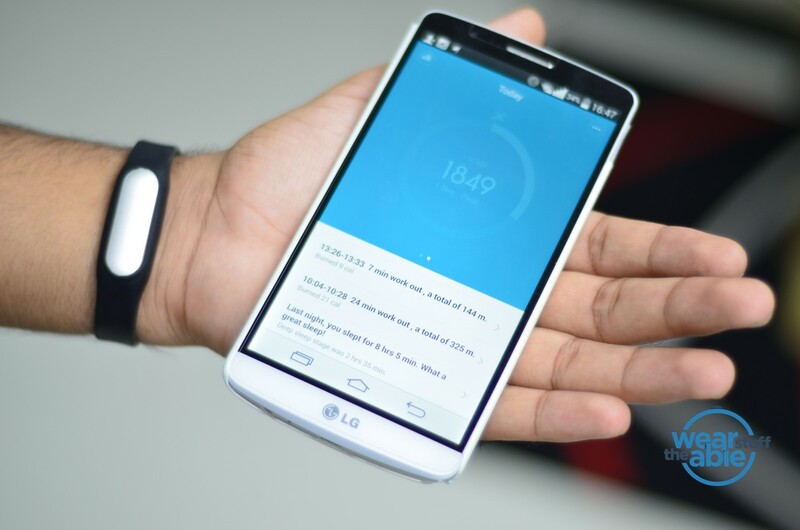 The app opens to a step counter and shows you feed of your recent sleep cycles, as well as walking activity. Plus, you can track previous day’s steps, how far you have walked around, and how many calories you end up burning that day. It has intensive features to analyze your sleep cycles, as it monitors how long you slept and for how long you were in a “deep sleep”, according to the movements during your sleep. Though, it does little to advice on how the users can improve their daily cycles. Still that isn’t necessarily a bad thing for those who don’t necessarily want a robot coach. Currently, there are only limited options to share your data publicly via social networks like WeChat, QQ, and Weibo. You can sync up your WeChat account with the companion app of Mi Band to get daily updates. As long as it tracks, the step counter, timers, as well as distance calculator is fairly precise, if not perfectly accurate. Overall, this is an ultra affordable fitness band designed to be the first entry-level fitness band, which certainly has all the abilities of any costly popular fitness bands. Except for the fact that its app doesn’t support the notification alerts. It could be an excellent gift for any family member of friends who are less tech-savvy, but have the need of tracking health data. The first and most foremost reason is to get this device is that it is relatively super cheap than its competitor. The device is easy to setup, as well as boasts a simple app UI, which may not be feature-rich, but has all the necessary things available on it with having an intuitive interface. On its first attempt on a wearable device, Xiaomi has managed to create the lightest and most comfortable fitness band, we have used till now. Moreover, it has the most accurate sleep tracking abilities, with showing you deep and light sleep information. Among all things, the device can give at least 30 day’s of battery life. Though, when we received the device form company, it had 45 days of battery juice left, which we were using till now. Amazing, right. What can be improved in device? Well, for one thing, company should extend the availability of this device to the more countries as it is currently available in the China only. The users outside the China have to pay up to $30, and more depending upon the shipping in their country, which makes its $13 price tag closer to its competitors. Eventually, the ultra-affordable price tag advantage disappears for most of the consumers. Since, the Mi Band is currently available in the China only, we are yet to see the official English App from Xiaomi. Another one of things that we’d like to see is that, the more easy usage of those LED lights that Xiaomi has given on its fitness band. They do not always work, as well as are tricky to readout whenever need to, even in the specified posture. Even though, the device has pretty much everything regarding the fitness tracking, it still lacks a decent notification and alerts options, as the device has all the hardware for that, but company has not utilized it for that usage. Update: Now there is an English translated App is available on Google Play Store. Here over to this link to download this app.